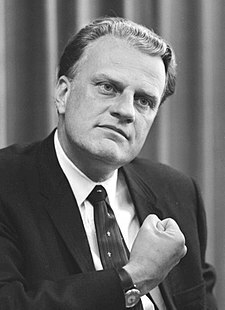 Today is the ninetieth birthday of much-loved evangelist Billy Graham. Recently, in the course of my work (i love my job! ), i came across a talk Billy Graham presented in 1998 at a TED conference, to a group of engineers, scientists, designers, and all-round bright people. His ability to communicate the gospel to a group and in a forum which is often stereotyped as anti-Christian struck me; his humility, sincerity, compassion, and love for God and for the Bible, are compelling. Here is someone who has lived and taught the faith in a way that has endeared him to people the world over and has brought many from all walks of life to a saving knowledge of Jesus Christ. Watch or listen to his talk at the 1998 TED conference on Technology, faith, and suffering (26 minutes well spent).